Nomad is a unique experience which shines a light on Somali heritage, giving a glimpse into the lives of a nomadic Somali family as they inhabit the space around you. 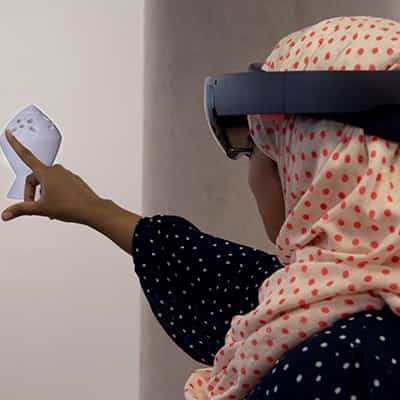 Wearing a Mixed Reality headset, you will experience sound recordings from the British Library, digitised objects from the British Museum and Powell Cotton museum, and people presented as 3D holograms. From a herdsman sleeping under the night’s sky, to a woman winnowing grain to the rhythm of a traditional song, you will witness these artefacts being used in the way in which they were intended. Abira Hussein is an Associate Producer at All Change Arts, an Independent Researcher and Curator specialising in Somali heritage, digital archives, migration, and health. In recent years she has worked with the British Museum, British Library, London Metropolitan Archives, Refugee Council Archive and Somali Week Festival, to deliver a number of projects and workshops engaging with the Somali Community. In 2017 she created the VR experience ‘Coming Home’ - in partnership with the British Museum and funded by Brighton Digital Festival and shown at Sussex Humanities Lab. Mnemoscene combine artistic, technical, and educational expertise to increase engagement with cultural heritage and the arts. Working with WebAR and Mixed Reality, Mnemoscene are supported by the Digital Catapult, UK and develop software used by leading heritage institutions such as the British Library and Stanford University Library.